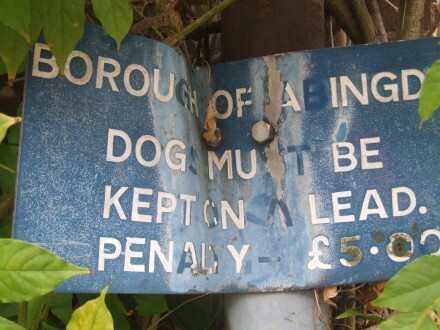 Steve has sent me a picture of a dog sign that looks the same age as the one put on the blog 2 days ago. He found it between Bella Napoli and Frend & Co Jewellers. 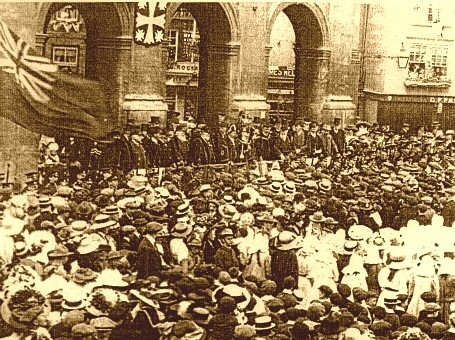 This is a detail from a larger Coronation picture from 1911 taken in Abingdon where the crowd could be gathered for the bun throwing, or perhaps for the moment when people first joined in ‘God Save the King’ for George V.
And here is an advert for A.H.Simpson & Son – Tailors and Outfitters from about that time, as it appeared in the Hooke’s Abingdon Almanack. 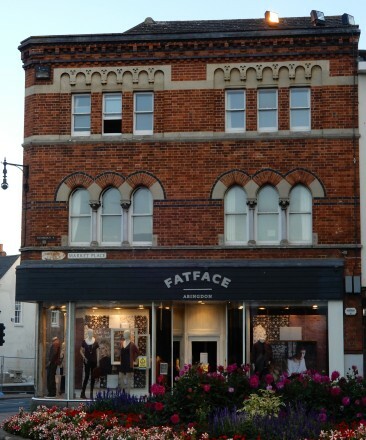 The building is now the premises of FATFACE Abingdon, where the facade of the upper two storeys have not changed much in over 100 years, but no longer copy the arches of the lower floor. 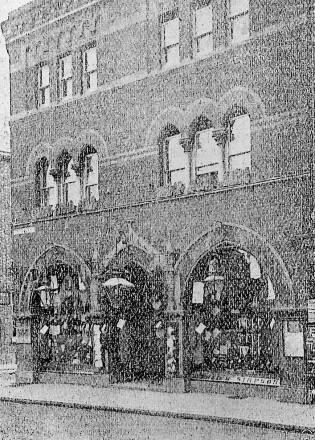 What philistine thought that a shopfront would be an improvement on the original arched ground-floor frontage of the current Fatface? A member of the same philistine group that thought (thinks) that Fatface is a nice name for a shop. But, as Daniel would point out, the flowers are lovely. BTW I thin the blue letter are simply evidence of the white letters being plastic and having detached. Georgics V is at the back of what passes for my brain. The Roman poet Virgil wrote four books of Georgics (about agriculture and the like) and I think Georgics V is an oblique and wry reference, but it all escapes me now. I feel that some form of reference to Virgil’s Georgics is too abstruse, but I like the idea of it being a left-over from the 1911 celebrations. It is not there on some of the late C19 photographs of the building but I have not yet pinned down exactly when it did appear. I agree, Ant; I don’t think the sign refers to a Roman poet, but to the allusion of “Georgics V” which I have seen somewhere else and cannot now remember. Won’t be long now before those flowers will be past their best so are all ripped up and chucked … before any of us mere residents get our grubby little mitts on them for our own gardens. But, they do look wonderful none the less…and so Abingdon continues to be A-OK. The Georgics sign is not there is a 1909 photo – see ‘Abingdon Past and Present’ page 19. I am coming round to the George V coronation idea. I just noticed this today (having lived in Abingdon over 35 years!) It is puzzling – the Roman poetry allusion doesn’t seem appropriate, and the coronation idea would seem to fit (I’m guessing bun-throwing took place to celebrate that event), except when I first saw it I thought it should say GEORGIVS. I’ll be interested to see if anyone can come up with an explanation. Have just checked on Wikipedia. There only appear to be four volumes of Virgil’s “Georgics”, so Georgics V can’t be a reference to it. “If you’re waiting for the bank to open or are just hanging about in Abingdon, take a look at the first floor level of Ciro Citterio, the building on the corner of Bridge Street and the Market Place. 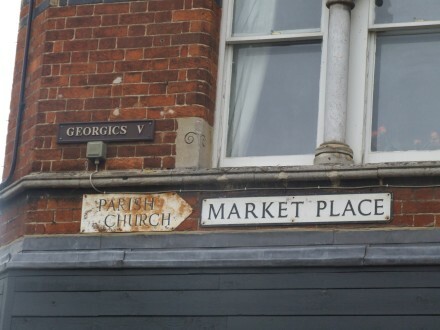 Just above the signs telling you that you are in the Market Place and how to get to the Parish Church you will see a short, rather dark nameplate reading GEORGICS V. How old is it and what on earth does it mean? You’ll never guess. For a start, it is quite modern – put up in the early 1990s. It has no connection with King George V, as some people have suggested. But it does refer to Virgil’s set of poems about agriculture, known as the Georgics, although he only wrote four. So … a humorous company name chosen by a classical scholar whose husband bred pigs!